SAMSUNG GALAXY GRAND DUOS COMING?? Remember the recently leaked Samsung Galaxy Grand?? Here, comes the dual SIM Version of the same. We got news leaks that the SAMSUNG GT-I8092 GALAXY GRAND DUOS is going to be revealed in 2013, maybe at the CES Expo in Las Vegas. 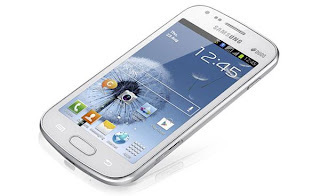 As we mentioned above, it is simply the dual SIM Version of the Samsung Galaxy Grand. So, it should sport all the specs just like those of the original version - quad-core 1.4 GHz Exynos CPU, Android 4.1.1 Jelly Bean, 2,100 mAh battery, NFC, LTE and a 5-inch LCD screen with 480 x 800 pixels resolution. The handset is said to be available in two colors, namely the Metallic Blue and Elegant White. Well, the disappointing spec in the device is the 5 inch LCD Screen .. So, this might make the device a mid-ranged device in spite of having all the software geared up in it..
Let us see how does it go for the Samsung Galaxy Grand Duos..
0 Respones to "SAMSUNG GALAXY GRAND DUOS COMING??"